From its source on the central plateau, the Whanganui River, New Zealand’s third longest, winds its way from volcanic peaks through rolling hill country to the Tasman Sea. This river has always been an important part of the region’s history and continues to attract thousands of visitors each year. The coastal city of Whanganui (also spelt Wanganui) is the main centre of the Whanganui region and the southern gateway to the Whanganui River and Whanganui National Park. This region is home to two epic adventures, the Whanganui Journey, a multi-day kayak and camping experience, and the Mountains to Sea Cycle Trail. Here are approximate travel times and distances to and from Whanganui. Travel times can vary significantly, particularly in popular areas during peak visitor months (December – February). For current travel times and updates on delays, roadworks and road closures, use the NZ Transport Agency journey planner before travelling. It’s always a good idea to allow extra time for photo stops and, when travelling longer distances, rest stops. Whanganui Airport is located approximately 6 km / 4 miles from the city centre. It is a small airport with currently only one operator, Air Chathams, providing flights between Whanganui and Auckland. 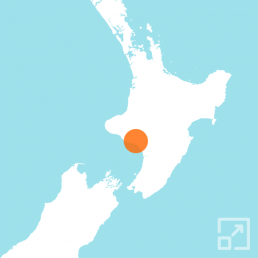 Palmerston North is the next closest airport and provides flights to more domestic locations. The landscape of the Whanganui region is diverse, from coastal lowland to rolling hills and mountains in the north as you head towards Ruapehu and the central plain. Whanganui city has typically less than 1,000mm of rain each year so is relatively dry and warm with less temperature extremes. The average summer (December – February) high in Whanganui is 22 °C / 71.6 °F and the average low is 14 °C / 57.2 °F. The northern and western parts of the region are wetter and colder with frequent frosts in sheltered inland areas during winter (June – August) and snow falling on the ranges and high country. The average winter high in Whanganui is 14 °C / 57.2 °F and the average low is a fresh 6 °C / 42.8 °F. Check current conditions and get the latest Whanganui weather forecasts on MetService.com. Looking for ideas to help you plan the ultimate New Zealand outdoor adventure? Here are some of the top things for active travellers to see and do in the Whanganui region. The Whanganui Journey is one of New Zealand’s officially designated Great Walks although in reality it’s actually a ‘Great Paddle’. This 145 km / 90 mile river journey follows the Whanganui River from Taumarunui in the north to Pipiriki in the south, a small settlement on the banks of the river. The journey takes 5 days with overnight stays in campsites and one night in a 24-bunk hut. There is also a shorter 3 day option with all of the relevant information available on the Department of Conservation website. As the name suggests, this 3-5 day 217 km / 135 mile cycle route will take you from the flanks of the North Island’s highest mountain, Mt Ruapehu, to the mouth of the Whanganui River and the Tasman Sea. Offroad Grade 2 and Grade 3 trails are linked by quiet rural road sections. There’s also a 32 km river section with a jetboat transfer. You can ride the entire trail from end-to-end or explore individual sections. Visit the official Mountains to Sea website to find out more.